The new interpretation studio setup at Conference Rental’s DC office mirrors that of high-profile international events and it gives interpreters the ability to service meetings anywhere in the world from one central location, with professional standards and comfortable working conditions. KUDO is a cloud-based multilingual collaboration platform for meetings of all sizes. It connects speakers and attendees anywhere in the world, on any device, through a seamless video and multilingual audio streaming experience. KUDO is backed by a team of industry insiders with 40 years of combined experience in conference interpreting and conferencing systems solutions. What exactly is a KUDO studio? Recent years have seen the rise of remote interpreting become accompanied by concerns about poor audio quality, connectivity issues and – perhaps the most detrimental aspect – deteriorating working conditions for interpreters. The resounding voice of the community is that interpreters cannot be expected to work in standard office environments, even less in open spaces, and definitely not in coffee shops. KUDO studios provide interpreters with a familiar and controlled environment from which to service meetings anywhere on the planet while upholding hard-earned professional standards, with superior audio and video quality, the desirable teamwork, and booth etiquette. The studios are a key feature behind the quality of KUDO’s cloud-based multilingual meetings. 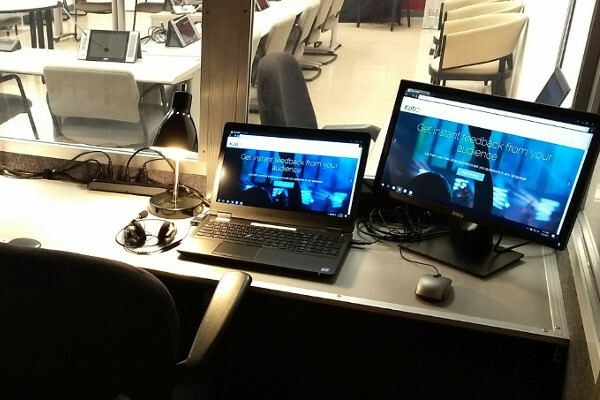 The first KUDO studio is suitably located at the Conference Rental office in Washington DC. The setup features a set of full-size, ISO-compliant booths seating up to three interpreters each. Interpreters have at their disposal professional-grade hardware to ensure crisp audio and HD video inputs at all times. Wired broadband connectivity, along with full Wi-Fi redundancy, and a technician standing by through the duration of an event, give interpreters the peace of mind they need to concentrate on the one thing they do best: interpret! The Conference Rental KUDO studio can support the language interpretation needs of several parallel events, in multiple languages. The modular setup allows booths to be used in a variety of ways, to service one or several meetings. Additional booths can be added in a matter of minutes, upon request, for as many additional languages as necessary. The booths are installed in an actual conference room fitted with the latest conferencing technology by Conference Rental, including push-to-talk microphones and an intelligent tracking camera. This versatility makes it possible to hold on-site events as well, with the added bonus of real-time language streaming for additional attendees not present in the room. So, if you are hard-pressed to find local interpreters for your next multilingual event, say, in Phoenix or Cincinnati, you can now have a team of DC-based interpreters join the meeting from the new studio. You can save on travel cost while creating efficiency without ever compromising on quality. What does it mean for conference goers? Participants at the venue can follow the meeting with HD audio and video in a language of their choosing, through their own devices. While conventional interpretation and language distribution equipment is not required for KUDO to function, it can integrate seamlessly with the cloud-based software. This hybrid solution was recently implemented at an event by a Brazilian telecom provider that spanned four cities across the globe. Working in tandem with Conference Rental in delivering traditional interpreting equipment at the event site, KUDO was able to provide a fully collaborative, comprehensive solution that ensured the highest standards for interpreters at other sites while streaming live multilingual video to multiple continents. Conference Rental welcomes interpreters to visit its new studio and learn more about the upgraded quality standards for cloud-based multilingual meetings. Are you interested in using simultaneous interpretation capability for your next event? Would you like to make your meetings accessible remotely to an international multilingual audience? Contact us today.